BiBNice pop snap beads is a fantastic toy for little girls. It can be treated as the “Disney Princess Jewelry Designer” for small girls, which makes it a wonderful kid toy helping enrich kids’ playing life. ❤Safe Material: bibnice diy beads set made of high quality plastic，BPA-FREE, no smell, non toxic, that should hold up well over time through prolonged use,no worry of hurt your hands. ❤Bright Colors and Various Shapes:They beads toys come in a lot of bright colors and different size and shape, Enhance color and shape recognition for kids. ❤DIY Creative:This set comes with 300 pcs in it which allows your child to easily Create various fashionable jewelry, like rings, bracelets, anklets, necklaces and other art craft. This super kids beading is a cool creative toy to kids developing imagination and hands skills. ❤Parent-Child Interaction and Enjoy Happiness:Parents can assist beside or parent-child play together.Meet the needs of kids’ jewelry dress-up. Endless combination of personalized jewelry. Endless creative fun. ❤Education Fun Toy:This educational beading activity toy for kids helps to develop fine motor skills, dexterity and hand-eye coordination. It can be used for learning color sorting, arts and crafts. 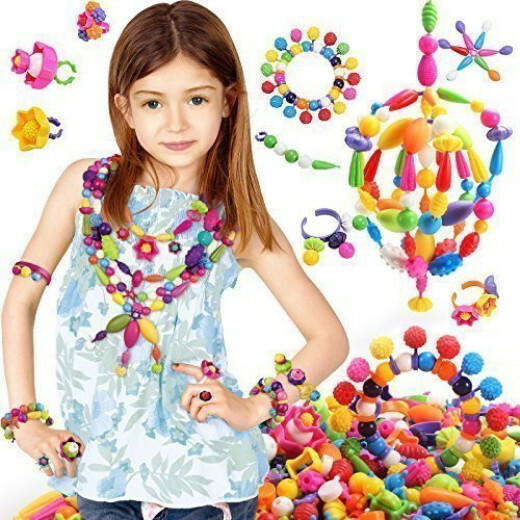 ❤Gift Craft ToysThe toddler stringing beads Ideal Arts & Crafts Gift , Great Birthday Gifts Present for Girls Age 3 – 10 years old. ❤Attention Here Product Contains small parts, so the product is NOT for children younger than 3years old.